Zynga easily tops the social games charts, but Electronic Arts is slowly creeping up behind the highflier, through a combination of acquisitions and launching games based on well-known brands. As of yesterday, EA became the second-largest social games company on Facebook, trailing behind Zynga, which is seeking $1 billion in an IPO. EA’s rankings have been propped up by the recent launch of the Sims Social, which over the past week became the fastest-growing game on Facebook, and by its roughly billion-dollar acquisition of PopCap, which has Facebook titles such as Bejeweled Blitz and Zuma Blitz. Electronic Arts jumped in the rankings yesterday after AppData, which tracks the performance of games on Facebook, started counting the performance of EA and PopCap together. The company’s acquisition of PopCap closed last month. Zynga’s lack of brand names might ultimately hurt the company in the long term, but so far it has been able to make its own hit titles, such as FarmVille, CityVille, Mafia Wars and Empires & Allies. Its IPO appears to be on track, unlike another Wall Street darling, Groupon, which faces increasing scrutiny and potential delays. But ultimately, investors may want to know how the San Francisco company plans to respond to increasing competition from companies with access to big brand names. EA initially got its footing in social through the purchase of Playfish, and over the past year it has used those resources to focus more on titles, such as the Sims and other recognizable names, like Monopoly, FIFA and Madden NFL. As of yesterday, EA had 71.5 million monthly active users, a distinct second to Zynga, which has 275.5 million monthly active users, according to AppData. The next-largest social games company is Germany’s Wooga, which has 38.5 million monthly active users. 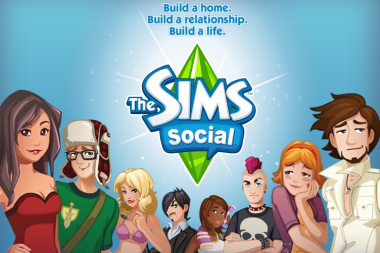 EA’s biggest title on Facebook is the Sims Social, which has almost 30 million monthly active users, or about 7.8 million players who return daily. At that size, the game compares to Zynga’s fourth-largest title, FarmVille, which has 35 million monthly users and eight million daily users. EA’s second-largest title is Bejeweled, a PopCap game, which gets nearly 10 million monthly users. Of course, both companies are expecting social games to become a significant business down the road. SuperData, a New York-based market intelligence firm, estimated in a report released last week that the North American social games market will grow 35 percent this year to reach $1.4 billion.